Rinse your hands off until they are "squeaky" clean. Take 5-10 drops of the conditioning solution and rub the solution onto the lenses for about 20 seconds. Now place the lens in your eye, or run it under water for 1-2 seconds before placing it into the eye. If it still fogs, you may have something on it and need to bring the lens in to be professionally polished. 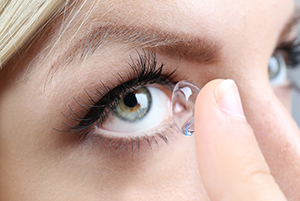 If your contact lens tears in the middle when you take it out of the case or blister pack, chances are you damaged the lens with your fingernail when you took it out. It might be just a partial tear and will not fully tear for a few days. Spill the solution out of the case, and very gently grab the edge of the lens. Even very slight pressure from your fingernails can tear a lens. Lenses can be stretched but are easily penetrated by any perpendicular object, almost like a knife going through soft butter. If your lenses tear on the edge, chances are you are getting the lenses caught in the case when closing. Put the lens in the case first, and then fill the case until the lens is submerged. Don't fill the case up to the top. Of course, there is always the possibility that the lens is a bad batch. If you are having problems, please call the office; we will do whatever it takes to remedy the problem. Are you experiencing other issues with your contacts? Call Skowron Eye Care today at (630) 834-6244 to discuss a solution to your problem with Dr. Skowron or a knowledgeable member of his staff!